Velvet bands - any type fur. Perfect gift for non-hat wearers. VERY WARM! Available in (from left to right, top row) raccoon fur, silver fox fur, blue fox fur , red fox fur, (bottom row) mink fur, arctic fox fur, beaver fur and grey fox fur. 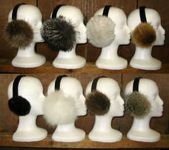 Page Summary: Wisconsin fur ear muffs, fur ear cuffs, mink ear muffs, faux fur ear muffs, and other fur clothing for La Crosse, Onalaska, Sparta, Tomah, Holmen, Prairie Du Chien, Richland Center, West Salem, Viroqua, Westby, Bangor, Hillsboro, Lone Rock, Stoddard, La Farge and surrounding Vernon County Wisconsin communities.